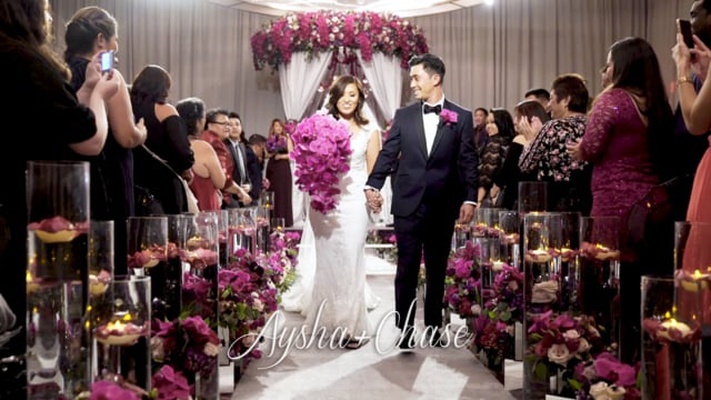 Aysha Wong and Chase Masuda met when they were just 17 years old. 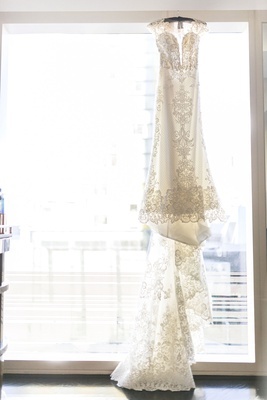 “Our friendship eventually turned into first love, and we’ve been together ever since,” muses the bride. 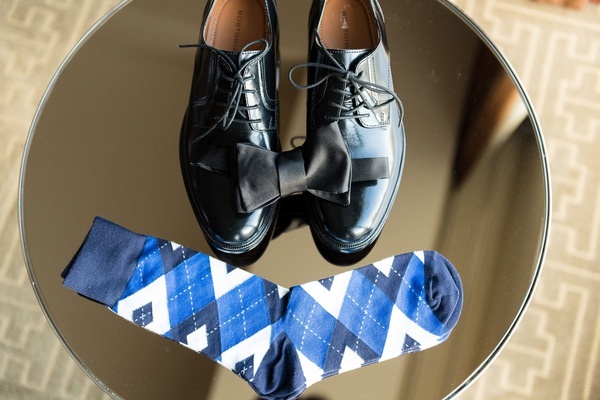 When the time came to propose, Chase asked his beloved’s father for his blessing, just as he had done almost 15 years earlier in order to date her in high school. 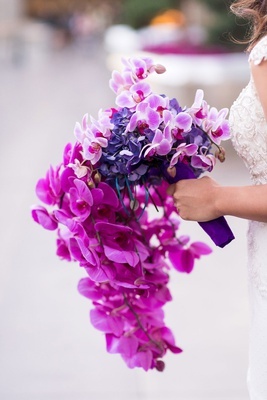 With an approval and engagement ring in hand, he presented Aysha with an early Christmas present and asked her to marry him at a lookout on the island of Oahu, where they both reside. 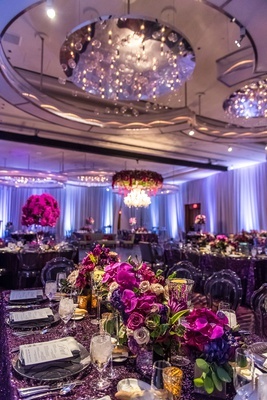 When searching for venues, Aysha and Chase desired a space that showed off Las Vegas in an elegant way. 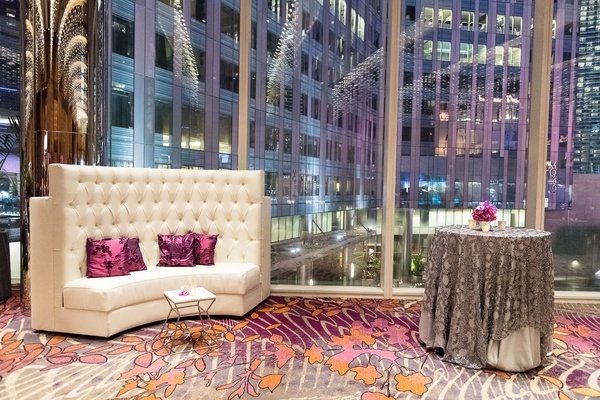 A luxurious hotel with floor-to-ceiling windows that offers views of “The Strip” was selected. 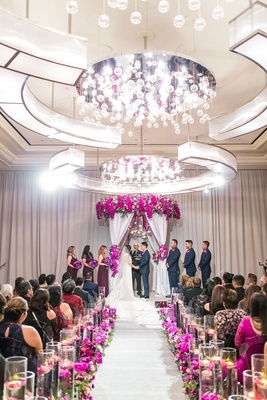 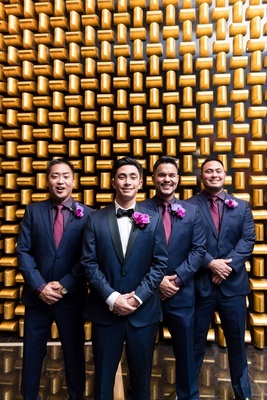 On the day of the ceremony, 135 attendees, most of whom had flown in from Hawaii, gathered inside a beautifully draped ballroom for the proceedings. 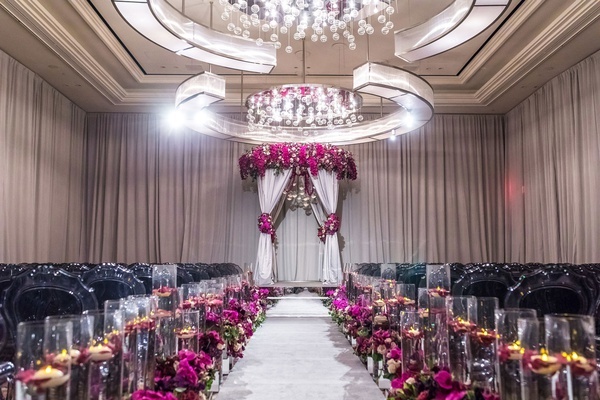 Translucent smoke-grey chairs were arranged on either side of the aisle, which was flanked with towering displays of fuchsia orchids atop mirrored risers and lined with floating candles in hurricane vases to provide an amorous ambience. 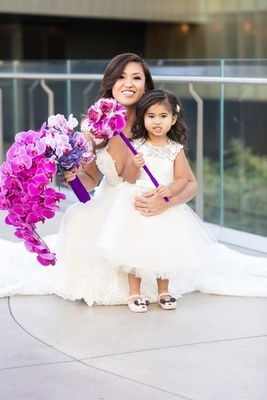 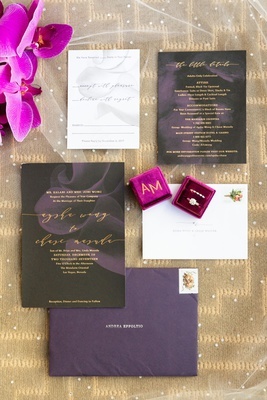 The bride was resplendent in a cap-sleeve gown featuring a keyhole back; she clutched an asymmetrical bouquet of hydrangeas, roses, and orchids in various shades of purple. 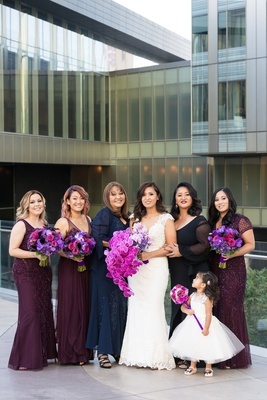 Though the couple had a “first look” prior to the ceremony – which they both note as their most memorable moment of the day – the groom still became emotional once he saw Aysha walk through the doors on the arm of her father. 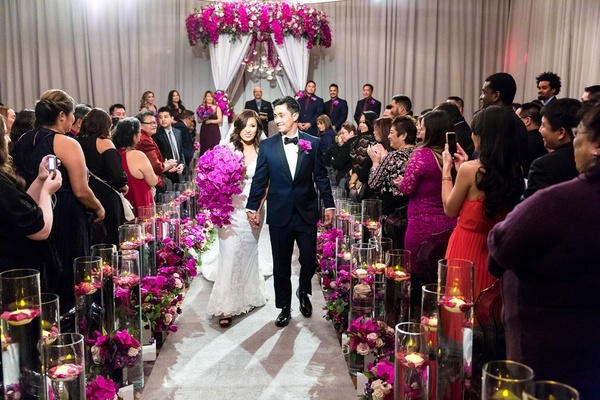 “She looked amazing and everything that built up to that moment was more than worth it,” he confirms. 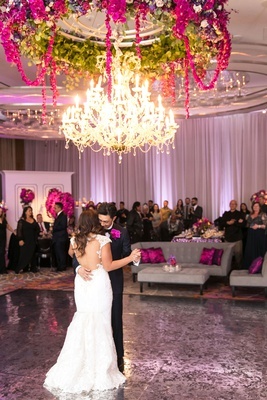 Following the touching vow exchange, guests enjoyed a cocktail hour before finding their seats in the ballroom for the sit-down dinner service. 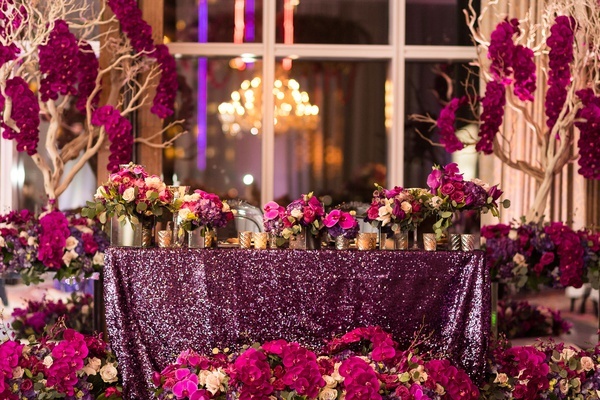 The rich colors of the ceremony continued into the reception space, which presented picturesque views of the city. 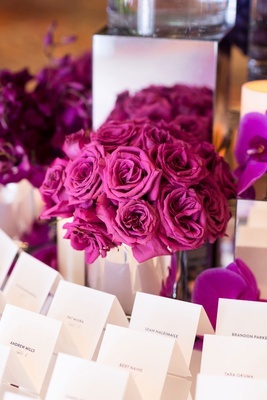 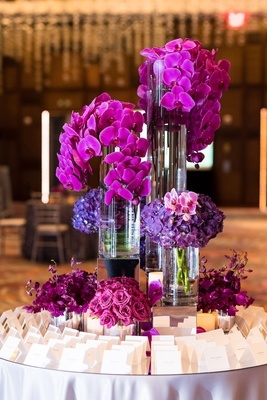 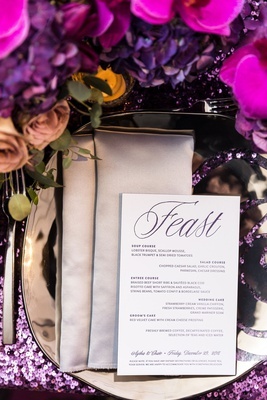 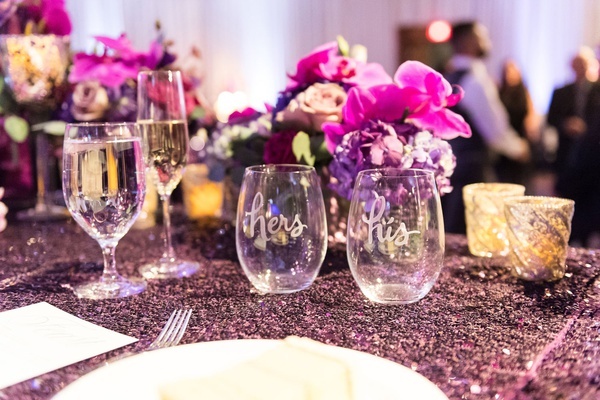 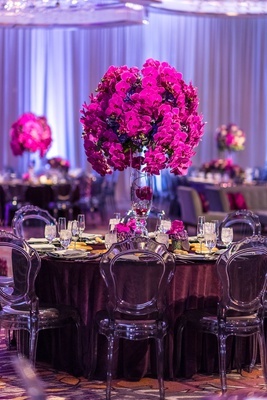 Tables were cloaked with eggplant-hued linens in velvet or sequins and topped with a mix of high and low centerpieces showcasing roses, hydrangeas, and orchids in tones ranging from soft lavender to bright fuchsia. 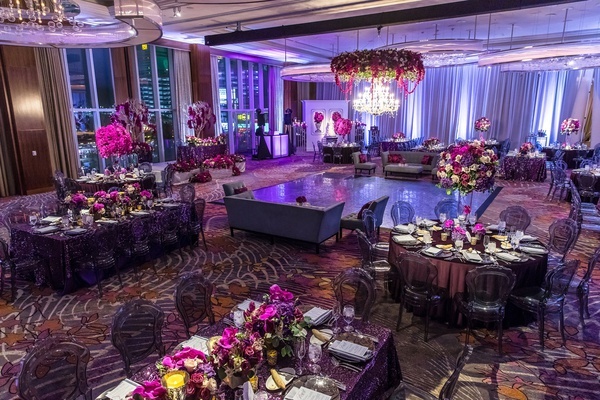 To further add to the vivid décor, an impressive eight-tier confection was placed in front of a whimsical wall decorated with live florals that appeared to be planted in painted urns. 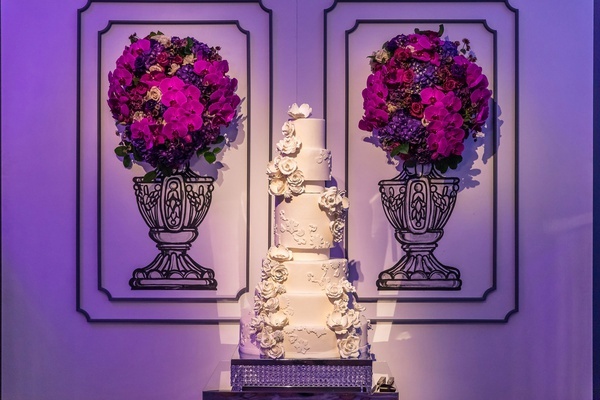 The all-white wedding cake featured pearl fondant accented with ivory sugar roses as well as a lace pattern found on the bride’s dress.